Our product range includes a wide range of pope gl10 line array speaker, pope gl212 line array speakers, pope gl12 line array speaker, pope gl-28 two-way linearray speaker system, pope gl-28 and gl-210 two-way linearray speaker system and pope gl28 line array speaker system. The POPE Professional® GL series, GL-10 is a two-way Line Array utilizes the new technology Directivity Correction Horn (DCH) ensures the constant directivity in the high-frequency range. The Waveguide Physical Driver (WPD) increases the output, sensitivity and also improves the directivity of the low-frequency range. The high and of low-frequency neodymium magnet drivers are integrates higher efficiency and power handling with reduced weight and dimension. The newly designed bass reflex enclosure has internal symmetrical heat-dispersion tubes to prevent the system from overheating. The POPE Professional's innovated rigging hardware can fly 16 cabinets array with 9:1 safety standard. The POPE Professional® GL-12 is a three-way Line Array system. The Line Array speaker consists of one 12" Neodymium woofer that is circuited independently, mounted in the separate bass reflex enclosure and four high-efficiency power handling 6.5" Neodymium high mid-range transducers are mounted in a V-shaped configuration combined with two 36 mm exit throat Neodymium compression drivers coupled to individual Waveguides those are vertically aligned. The Line Source Former Horn produces wavefront similar to ribbon driver. Advanced European transducers are providing the high power-to-weight ratio. POPE GL-28 is a compact two-way dual 8" transducer with 2" voice coil, Neodymium magnet, Each unit Impedance: 16 ohms¸ Rated Power: 400W , Max Power: 1600W, Sensitivity: 95dB @ 1W/1M and dual 1.76"compression driver, polyimide diaphragm, Neodymium magnet, coupled with a constant directivity horn. Each unit Impedance: 16 ohms¸ Rated power: 100W, Max Power: 400W Sensitivity: 108.5dB @1W/1M. Each GL-28 speaker can produce 1000 W power continuously. The POPE Professional® GL-28 Line Array designed to bring performance benefits to a variety of small and medium scale applications. The frequency range is 80 Hz - 20 KHz with very smooth frequency and phase response. The enclosure features charcoal foam backing with grille to protect drivers. The speaker cones are treated with weather-resistant compounds. The POPE Professional® GL series, GL-210 is a two-way Line Array utilizes the new technology Directivity Correction Horn (DCH) ensures the constant directivity in the high frequency range. The Waveguide Physical Driver (WPD) increases the output, sensitivity and also improves the directivity of the low frequency range. The high and of low frequency neodymium magnet drivers are integrates higher efficiency and power handling with reduced weight and dimension. The newly designed bass reflex enclosure has internal symmetrical heat-dispersion tubes to prevent the system from overheating. The POPE Professional's innovated rigging hardware can fly 16 cabinets array with 9:1 safety standard. The POPE Professional® GL-28 is a compact two-way dual 8" transducer with 2" voice coil, Neodymium magnet, Each unit Impedance: 16 ohms¸ Rated Power: 400W , Max Power: 1600W, Sensitivity: 95dB @ 1W/1M and dual 1.76"compression driver, polyimide diaphragm, Neodymium magnet, coupled with a constant directivity horn. Each unit Impedance: 16 ohms¸ Rated power: 100W, Max Power: 400W Sensitivity: 108.5dB @1W/1M. Each GL-28 speaker can produce 1000 W power continuously. 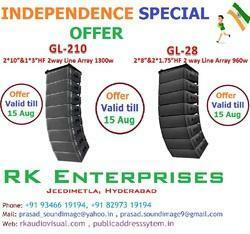 Looking for Line Array Speakers ?